Writers’ Workshop believes in the child’s ability to construct their own writing. Students immerse in a genre through an anchor text and through whole class and peer discussion unpack the piece together. Over a month or longer students move through a writing cycle - Prewriting, Drafting, Revising, Editing, Publishing. An hour each day is dedicated to the writing process, each day following a similar rhythm of teacher mini-lesson, a quick practicing of the skill, and the rest of the time is spent writing alone, in small group, or conferring with the teacher. Students regularly read their work aloud in rough form to peers, get feedback, and go back at it. The cycle ends in a publishing party where ideally the learning community beyond the walls of the classroom join to validate student work. The good is student choose their own topics and are taught through the process that text is not merely something we decode but something we create from life experience, alone, with peers, and whole groups. Students repeat the cycle of a writing process throughout the year. Each cycle culminates in a published piece of work. The bad is that anything scaled to such a degree is bound to lose its essence. Lucy Calkins in Lessons From a Child and The Art of Writing goes deep into child writing as a constructivist process with near total freedom in time to complete a writing piece. Over time, through Columbia Teachers College, the “program” was implemented across New York State, across the country, and into many international schools. Adaptations had to be made to survive No Child Left Behind and Common Core. What began as a ground up constructivist method morphed into a robust “program” incorporating a reading block as well. Although the research and training intensified, the program has grown into a corporate hierarchy where districts unload mammoth amounts of money to send “select” teachers, coaches, and administrators for trainings at Columbia (insert image of cult like frenzy on NYC subways any given morning of trainings). A well-intentioned grassroots development that was supposed to empower students and teachers grew into a top down approach to literacy. Like Ron Berger, quoted above, author of An Ethic of Excellence, and creator of Expeditionary Learning Schools, the “program” has grown into something unrecognizable from its origins. In such a heavily monitored system, the creators would not be able to enter as a teacher themselves. I am a proponent of preserving “old growth” in schools, and the slash and burn approach to implementing the new, even when the philosophical core is correct, damages the profession. As one colleague who had worked in three different TC schools explained, the “program” was different in each school indicating there was plenty of flexibility to the design, but at the school we were working, there was steep competition to be selected to get sent to NYC for training. Terms like “that’s not Lucy” were thrown at those that attempted to project collaborative documents around the room to engage in some of the practices described in the TC literature - buddy editing, dialogue journals, co-creating, writing with and for professionals, etc. Project schools are on a scale, year 1 to year 8 where different components of the program were released each year. “Mastery” it was whispered, something akin to the farcical “pedagogical automaticity”, takes 12 years. Asinine in a school fighting to maintain an average teacher retention rate of two years. Please read the above not as bitter, but as absurdly comedic. I am a promoter of all constructivist learning and personally piloted the program for two years before it was officially adopted at my school. I mixed in student created video presentations of writing, integrated with Arts, led whole class interactive raps around an Afro-Colombian drum, and led call and response campfire editing sessions demonstrating how one computer, one projector, and one wireless keyboard (or one long chord) brought in projected text as a living, breathing, constructivist tool. I spent one hour every day on four to five student writing pieces preparing for the conference the following day (separate from the weekly on the spot conferring sessions). During parent conferences, the grades were on the table, but all we would talk about is the adventure in writing development their child was having as we reviewed artifacts from the writing portfolio. When the formal adoption of the program began, a coach was brought in and we all started from square one. Teachers who previously integrated drama, hand puppets, mask making, and song into their writing stopped all of this for fear of being seen as not following the program. The ugly is resistance to the multimodal inputs surrounding the construction of language. To use the example of philosopher painter Kazimir Malevich and his 1915 Suprematism moment with Black Square, after the complete deconstruction of centuries of illusory painting into the non-objective world, Malevich stopped painting for five years, and only wrote. Dare I say I somewhat disagree with Malevich. The brush is sharper in communicating precisely and remains the predominant literacy goal. The graphic, physical artifact, reach around language into the a wider array of cognition and even beyond into our emotional core. "When a flash of lightning illumines a dark landscape, there is a momentary recognition fo objects. But the recognition is not itself a mere point in time. It is the focal culmination of long, slow processes of maturation. 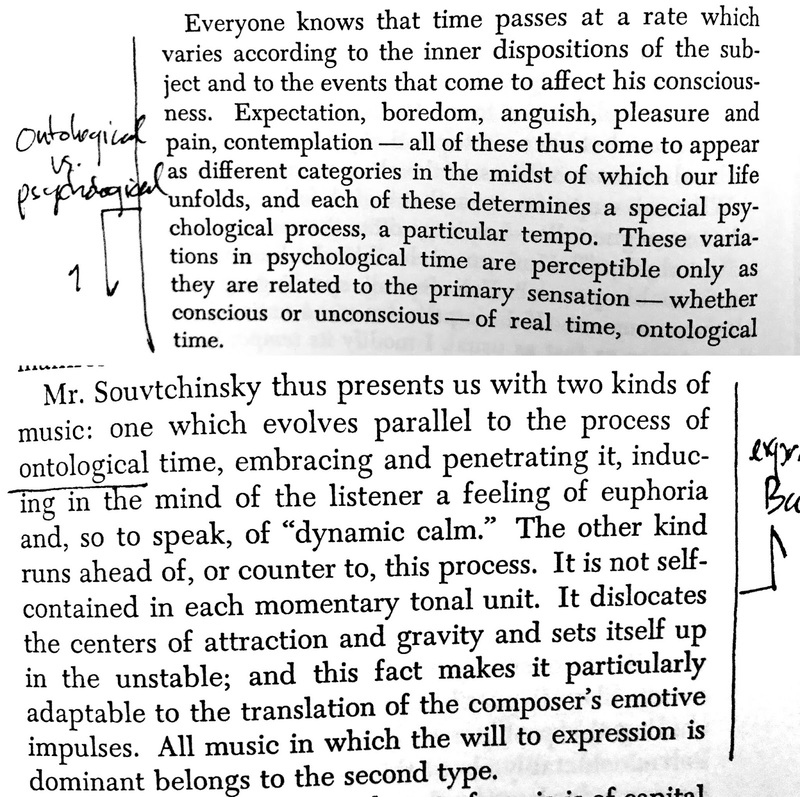 It is the manifestation of the continuity of an ordered temporal experience in a sudden discrete instant climax." Engineering backwards through the painting/object uncovers the stages of concentrated thought, the intent to solve a hypothesis through the medium, the social construction surrounding the artist, and the contributing cultural context. Forward through the painting the constructivism continues as we decode and contextualize the painting/object. 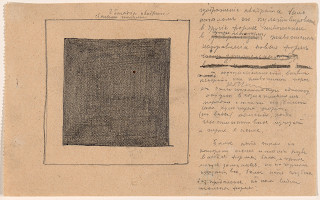 How many layers of words have been spoken, arguments written about Black Square since 1915? Why would we remove this construction of language from the teaching and learning of writing, this opening up of other channels of packaging communication? My 20 years of teaching have always been in classrooms where 90+% of the students do not speak English as a first language. Language both broadens and deepens by lowering the threshold of engagement with the decoding and construction of graphic, physical artifact, or other nonverbal participatory experience. These are gateways to the metaphoric mind, the “life” of language. The UX design world can attest, you don’t want your designer to “write copy” as the specializations between the creation of powerful imagery and sharp, concise language demanded in today’s media world are different. But, we DO want our students to cross back and forth between these worlds of graphic and text, to experience a more “grounded cognition”. Multimodality exists within the program in “episodic” form, sketching an idea for second language learners, collecting written perspectives around an evocative image, or playing with prosody in reader’s theater, but there lacks the “critical event” where students develop language at the same time as developing other modalities over time as the learning product. To compare this to the IB program, the literature and performance course or the exhibit space within PYP, would be an example of this interdisciplinary product. Children by nature are communicators across any medium necessary and while mastering the symbolic form of writing is a demanding discipline, this is not a long, dark tunnel children must walk alone. Meaningful writing comes from meaningful language through oral, social, multimodal experience. When given choice, time to move through multiple interactions of writing, having peer and teacher feedback, exposure to master works in the specific genre of study, and performing the final product before an authentic audience, children are capable of mastering complex forms of writing. I have reflected here on the Lucy Calkins version of Writing Workshop since that is what I have had experience with. Even through the frustrations of how the program was implemented, I also saw great student writing produced, the product being the true measure. We took Ron Berger's words seriously and made the writing celebrations school wide events. This idea of celebrating product of student work is a repeated theme from Rachel Fink's description of the JECC Reggio Emilia approach where student learning artifacts are on constant display, to Expeditionary Learning's celebrations of student projects, to IB PYP's "exhibition". I have spaced these posts out more than I had originally planned as they are getting longer. In the next post on this series about products of learning, I will look at Maker Centered Learning and how student voice, maker sensibilities, and community are affected. Berger, R. (2003). An ethic of excellence: Building a culture of craftsmanship with students. Portsmouth, NH: Heinemann. Calkins, L. (1983). Lessons from a child: A case study of one childs growth in writing. Portsmouth, NH: Heinemann. Calkins, L. (1994). The art of teaching writing. Portsmouth, NH: Heinemann. Calkins, L. M. (2010). 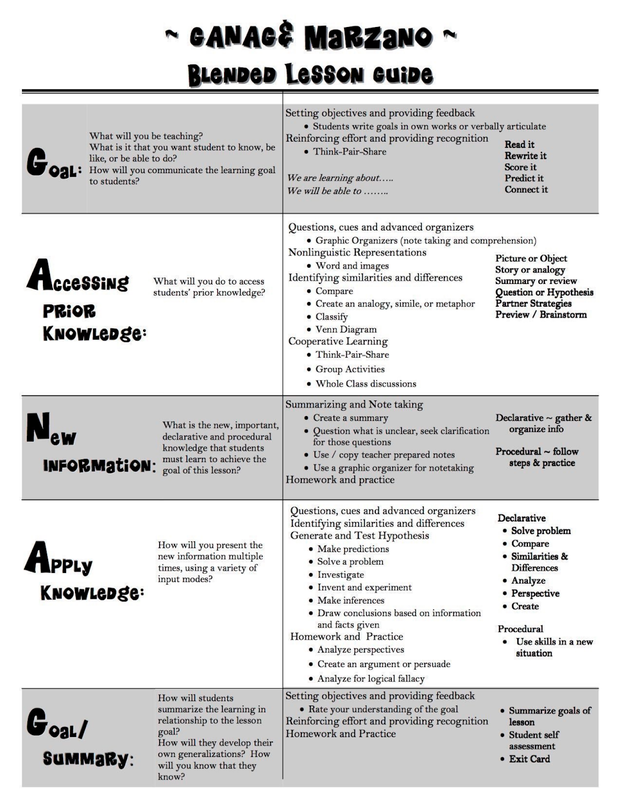 Constructing curriculum: Alternate units of study. Firsthand, Heinemann. Dewey, J. (1934). Art and experience. London: G. Allen. Goldberg, G., & Serravallo, J. (2007). Conferring with readers: Supporting each students growth and independence. Portsmouth, NH: Heinemann. Judd, D., Judd, F., & Murray, C. (2017). Malevich 1973-1974. In Donald Judd Writings(pp. 254-266). New York, NY: Judd Foundation. Malevich, K., & Hilberseimer, L. (2003). Kasimir Malevich: The non-objective world, the manifesto of Suprematism. Mineola, NY: Dover Publications. Marcade, J. (2012). 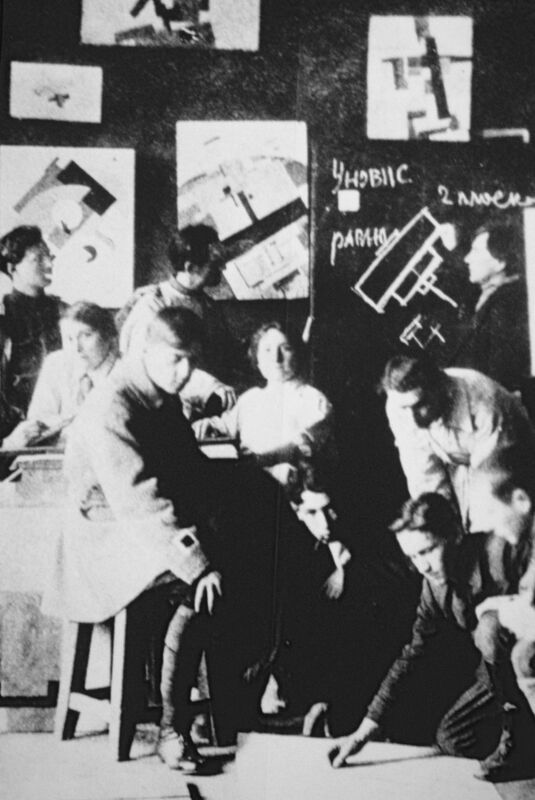 Malevich, Painting and Writing: On the Development of a Suprematist Philosophy. New York: Guggenheim Museum. Prescott-Griffin, M. L. (2007). Writer to writer. Heinemann. In a podcast conversation with Rachel Fink on why she was attracted to the Reggio Emilia approach to learning for The Journey: Early Childhood Center in Tel Aviv, she mentioned the above. Using Fink’s example of learning product, of a group of young learners all producing near identical results and how that clashed with her belief system, I reflected on my own practices, research, and conversations with educators to create a list of approaches and methods that validate children as “competent, capable learners who are motivated to learn”. I think that by working backwards from learning products, productions, artifacts, and evidence of process through documentation, we can work with and around institutionalized learning metrics, and unlock true meaning within our belief systems and school mission statements. In this post, building from my notes, I will compare Restorative Practices and Project Based learning, how their products of learning differ, and how they contribute to a constructivist belief system. Restorative practices builds from traditions in ancient and indigenous cultures around the world. In modern justice systems, offender and victim are separated and the social capital of community is not restored. Through informal interaction and formal meetings such as circle talks, students and teacher facilitators work through conflicts with the cooperative goal of building an integrative learning network where peer relations are a critical element. We have to accept that conflicts in classrooms will arise and the goal of restorative practices is not a replacement of a punishment system, rather an investment in positive proactive measures in order for students to spend less time on disciplinary office visits. The product of learning is a long game in that over time students feel part of a group and responsible for its well being. In an extreme case, I witnessed a group of third graders share their experiences with death in order to console an emotionally walled in student who had lost his father. A year later I watched this same student read his carefully written poem about his father in front of the whole learning community of students and parents. Restorative practices are not just about conflict resolution, but address how a community responds to crisis and moves forward. The week this student came back to school, one of his classmates stood up in the middle of a circle talk and gave him an outpouring of empathy and compassion. While the immediate product was the bursting of the guerrilla in the room, the long term product was establishing the school as a safe place for the student to process grief. 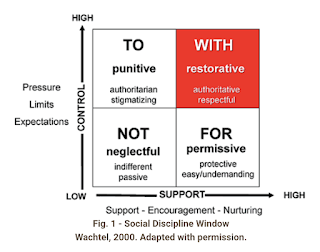 Restorative practices reflect a belief that children are living participatory parts of community, and with facilitators are capable of the restoration of conflict, even in the most extreme cases. The language barrier often distorts our perception of children’s abilities, and how moral judgement develops before linguistic expression in children. This belief overlaps with Morton Deutsch inspired Johnson and Johnson’s work with collaborative learning, that learning is not just an internal cognitive process but a social construction. Cary Roseth continues this research showing that when peer relations and cooperative goals are the focus over individualized or competitive goal structures, learning improves by multiple forms of measurement. Another core building block in this belief is Vygotsky’s Zone of Proximal Development in which the community of learners present are critical tools in extending a learner’s grasp. In working towards the creation of a product, service, or experience, projects feed off of peer relations, distributed teaching and learning, cooperative goals, interaction with real world professionals, and an authentic audience. A writing piece, graphic, oral performance, or other artifact go through repeated cycles of prototyping, each iteration presented before peer or whole class for critique and reflection. Some describe this environment as a safe space to fail fast and often. For me, this ensures learning will not only happen, but will go deep. Good projects crescendo, often only ending because of a deadline. Projects design for intrinsic motivation, engagement, and “need to know”, deemphasize the extrinsic motivation of grades. Differentiating PBL from STEM and STEAM: challenge-based approaches contextualize learning and could become project based, but often draw tighter parameters around voice and choice in order to get at specific curricular objectives. Like Fink’s frustration with cookie cutter individual products, the voice and choice may only be evident within the mold of the final product. Fink observed kids choosing colors and patterns to include in a predetermined shape, much like the middle schoolers I have observed chose their problem solving methods of wingspans and flaps, but they all created model wooden gliders. This is not to say that such challenges are not important within learning environments and they can easily be modules within larger projects, just as teacher read-alouds and lectures have a definite place, even within project environments. 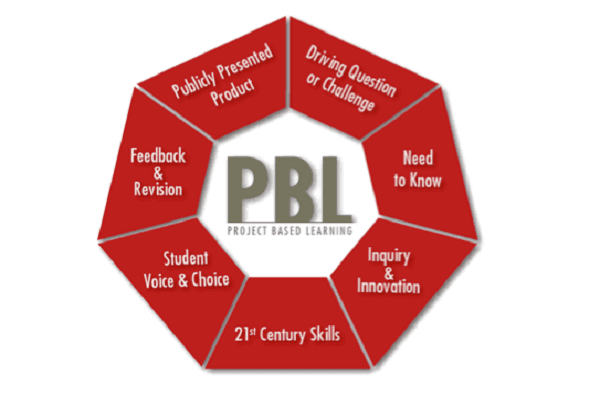 Buck Institute and New Tech Learning also show the wide spectrum within PBL. BI says that any project work is good, while NTL applies a more rigorous approach to whole school adoption of project method. BI promotes rubrics that create reflections on learning objectives difficult to quantify (ie those too subjective to be taken seriously by many schools), while NTL grades are based on communication, collaboration, agency, knowledge, and thinking. The spectrum of how much project based learning goes back to the Dewey/Kilpatrick debates on "the project method", Kilpatrick arguing for unrestricted student choice and motivation, while Dewey promoted the role of the teacher and curriculum in developing student critical thought. Beliefs: Learning is far more complex than a series of inputs and outputs of cognitive processes. Starting with inquiry and working toward a product of learning creates a kind of narrative bracket to learning where purpose and choice drive student motivation to master skills and content. Early learners come ready with three types of agency - individual, proxy, and collective - that projects should provide space for. Children with scaffolded guidance and continuous cycles of feedback are capable of managing their own learning. Restorative practices and Project Based Learning show how very different products of learning can be, from the utilitarian product of a project developed over a specific period of time with specific learning goals in mind, to the long game open ended construction of a classroom and school culture of restoration, one informal or formal interaction at at time. Each complements the other in the belief in children as capable, co-constructors of their learning environment. I hope that by walking through each approach and reflecting on how product unlocks belief, it may shed light on how the branding and marketing of learning approaches distract from the more important goal of identifying what our beliefs are about what children learn, how they learn it, and why. 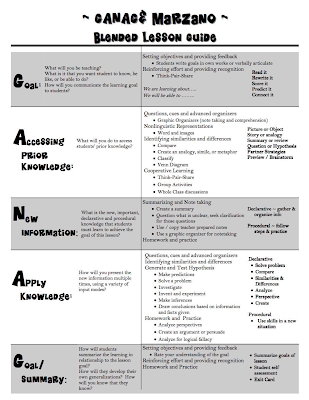 In the next post this strain continues with Writer’s Workshop, Maker Centered Learning, and Design Thinking. Costello, B., Wachtel, J., & Wachtel, T. (2009). The restorative practices handbook: For teachers, disciplinarians and administrators. Bethlehem, PA: International Institute for Restorative Practices. Hallermann, S., Larmer, J., & Mergendoller, J. R. (2016). PBL in the elementary grades: Step-by-step guidance, tools and tips for standards-focused K-5 projects. Novato, CA: Buck Institute for Education. Howe, J. (2002). The Kuna gathering: Contemporary village politics in Panama. Tucson, AZ: Fenestra Books. Then this last month I met Rachel Fink, director of The Journey: Early Childhood Center in Tel Aviv, who, when dissatisfied with her search for the right school for her daughter, decided to create it for her. Like Kohlmann, Rachel did not just follow her belief system, she formed a community of like minded teachers and parents who were discontent with what preschools offered. She reflected on her own experience with Reggio Emilia in New York, connected with Dr. Naama Zoran and others who have worked on growing the Reggio Emilia culture in Israel, and researched the early childhood history of the Kibbutzim. Each time unit, planned as a prepackaged bundle of knowledge, a linear progression toward a test, leaves little room for spontaneous construction. Marzano and others are so right in their research identifying aspects of learning that work within this school model, particularly in the Cognitive Domain of Blooms Taxonomy, but with little consideration for the Affective and Psychomotor Domain. 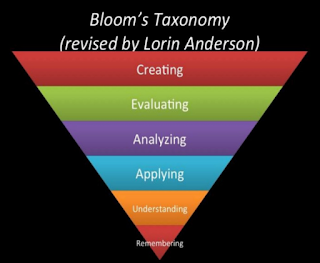 The prepackaged memory model treats Blooms Taxonomy as a hierarchy of cognition, a building from lower to higher levels. 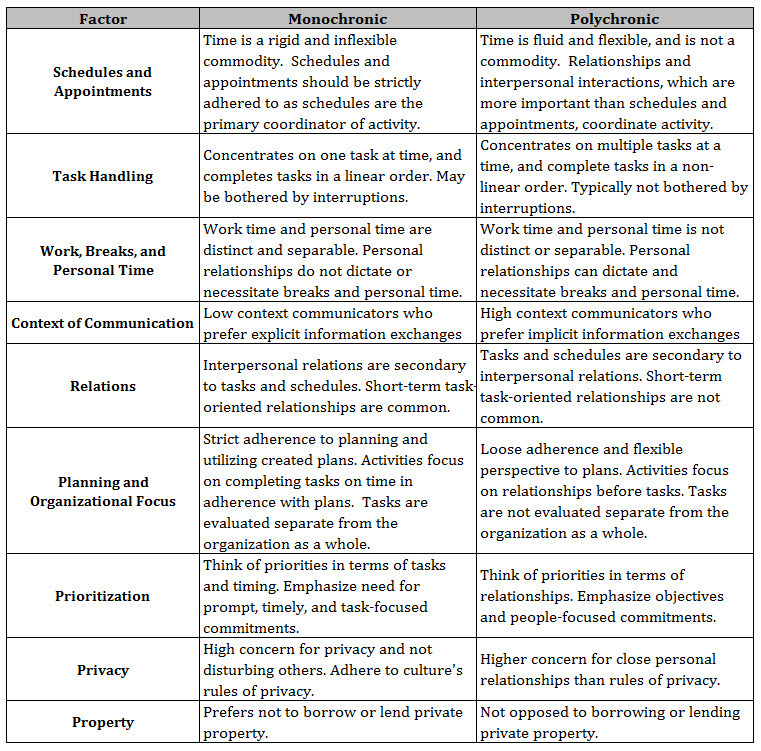 What is missing is Vygotskian constructivism where learning happens in the context of tools within one’s environment - tools with the purpose of either construction or as artifacts to spark inquiry - where upper levels of cognition frame and spur the lower levels, and as Dewey explains, learning is driven by repeated experience and reflection. 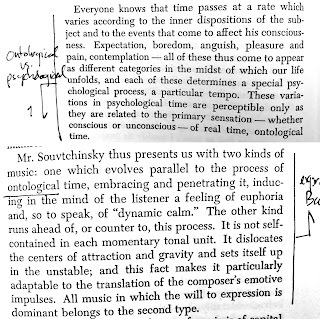 Time, especially when imbued with meaning through music, according to Stravinsky, is psychological, not ontological. 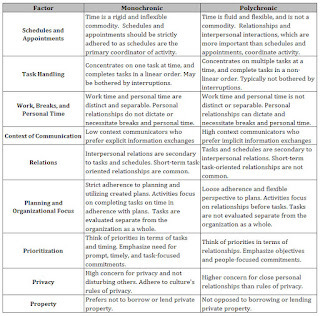 Institutionalized learning, organized around mono-chronic principles, should also account for the poly-chronic. Cycles of experiences and reflections, iterations of learning products should culminate in “critical events”. Kahneman would most likely say we have created a system where we fool ourselves into believing that real learning has happened, we prepackage memory without investing in all the factors that create the meaning in "experience". Like the vacation photos that stream on Instagram that may as well have been assembled with a green screen and a Google image search, we create simulations of learning experiences, an image of learning captured in a metric. It makes sense. Reggio Emilia was formed by communities of women who had no schools after the destruction of World War II. They decided to create a new school system themselves, one that would reflect their values and hopes for the future, far from Fascist Italy, and further from pogroms of the past. The Kibbutz education movement, heavily influenced by Rousseau, Froebel, and Zionism meant to create a space where children would grow up communally, close to the land, an attempt to "make the desert bloom" (Rachel Bluwstein), a territory linking the construction of a new jewish identity with statehood. Rachel is quick to point out the distance between the early Kibbutzim and JECC in modern Tel Aviv, but at the same time believes in the continuity of their early childhood beliefs, that children are capable constructors of their learning and contributors to society. To emphasize the point she explained how their current site is a reconstructed bombed-out building and on opening night parents gathered on what was a construction site at the time, the perfect metaphor for the malleability of all things, particularly learning environments - a lesson hard learned by the Gates Foundation, who after years of trying to identify the traits of an ideal teacher, have scrapped scaling teacher methods for a more holistic ground up systems based community approach to school improvement. While working in a magnet Arts school in Galveston, Texas, the cultural divide was inescapable. The teachers lounge showed the split, one half Latino, one half African American, no mixed tables except for a couple of white dots, myself and a visiting poet, Jenny Browne. From the beginning of the year I had laid the groundwork by making home visits to every family with a student in my classroom. Jenny then worked for three and a half weeks on poetry in a laboratory model - “experience”, write, share, reflect. At the end of the month a “critical event” was held, a poetry reading in an historic setting on The Strand in downtown Galveston. 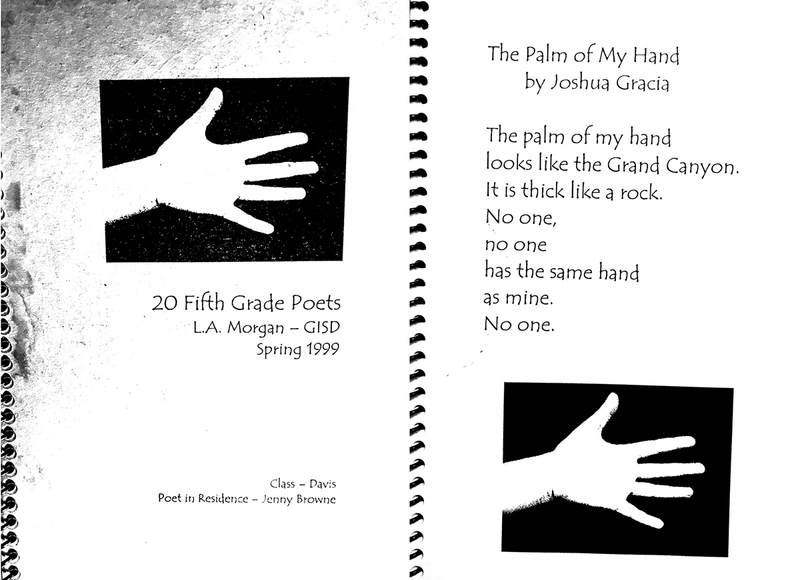 Poems that had gone through multiple versions with feedback from different students, brought to life through oral presentation, recorded in book form for each family. Through cooperative effort, a culminating “critical event”, proactive threading, and belief that community is critical for a learning environment, seemingly institutionalized obstacles were overcome. Latino parents, most of whom were illegally in the country, may otherwise have been suspicious of “the institution”, and African-American parents who began the year hostile to the idea of “Visual Math”, all came together to validate all the students poetry. 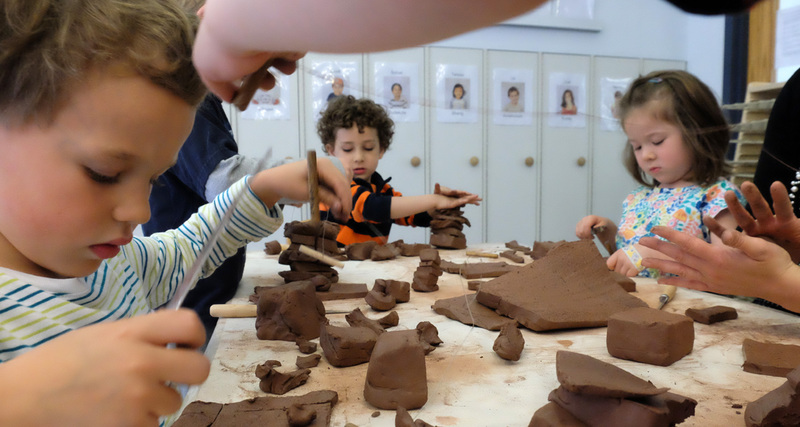 Inquiry based learning is normally associated with Project Based Learning, Design Thinking, Reggio Emilia, Montessori, Waldorf/Steiner, and Papert’s constructionism lab at MIT, but even the most rigid of systems can account for student wonder. Allowing space for carefully curated immersion and time to wonder and reflect is more efficient than beginning with preordained essential questions, rubrics, and expectations - particularly when accounting for motivation, engagement, and the narrative framing of one’s learning. While coordinating and co-teaching a six week project on native peoples students used digital and physical resource in the library to collect artifacts about a particular group of people. In small groups, a teacher facilitated a see-think-wonder routine recorded questions that were then posted on a giant wall. Small groups revisited the questions, creating affinity groups and titling each category with their own “essential question”. This launched the next six weeks of study as questions were revisited during check-ins. The inquiry process took 90 minutes by blocking together a Social Studies and Library period. By using rotations, each with a teacher facilitator, and by making sure the “artifacts” would by continuous points of research and reflection throughout the project, no time was lost. Two days into the project every students knew what problems they were trying to solve over the next weeks. Even within a learning community where belief systems varied greatly teacher to teacher on how much students could manage their own inquiry, the project showed four critical aspects of collective inquiry. validates both individual and social constructions. students created an incredible depth of inquiry we would not have dared prompt them with. facilitated affinity grouping and group formation of essential questions produced an almost identical replica of essential questions teachers had written previously. Teaching in International Schools in Latin America can be a challenge for parent - teacher communication. Society is structured by classes down to your monthly utility bills based on stratus 1 to 5, determined by average incomes in the area. A director once called a faculty meeting informing all the foreign teachers that they were not to socially engage with anyone below Calle 70 because of associations with poorer neighborhoods. Meanwhile we all looked at each other bewildered since half of us lived below 70. Basically, “teacher” can be associated with empleada. A pencil falls off of the second grader’s desk and the student looks up at you, waiting for you to pick it up. Coming from the U.S. public school system, this child appears over-indulged, consentida, mimada. Yet that same child most likely arrives to school with a defined sense of self at an early age, an agency of voice, and few inhibitions in learning. Generally, Colombian identity and belonging form in concentric circles - family at the epicenter, extended family, social clubs and organizations, work relations. Young students expect to bond with their teachers and treating education like a business exchange creates a cultural rift. For this reason relations with parents are important, moving teacher, in the child's eyes, closer to that epicenter of belonging. Students need to see their teacher as a friend of their parents, and this is a challenge given the family, extended family, and clan-like makeup of society. I learned this the slow, hard way and would often not talk to some parents until there was problem or crisis. Then a colleague passed me a parent inventory of child learning habits which I asked parents to fill out the first week of school during parent night. I was overwhelmed with the care, attention to detail, and brutal honesty parents took in explaining their child. The real key was taking the time to read these carefully as ethnographic study, then revisit them and highlight key points. During parent-teacher conferences, with grades and data spread out on the table, we would spend most of the time talking about the inventory combined with examples of student work and anecdotal narratives from my own running notes on the child. This is not pandering to parents, it is centering the discussion on learning between three central perspectives - student, parent, teacher. The quantitative data is there to help us understand what is happening, but the why of learning can only unfold through our own sense making, through our reflections combining experiences, learning artifacts, and analytics. The quantitative data can merely inform our beliefs and the narrative we create around learning. The early Kibbutzim attempted to solve the challenge of communal child education by creating an environment where the children belong to everyone, an unprecedented social experiment in child development. There is something to applaud here and draw on for schools everywhere. Maybe we need to contemplate broadening our social contract in regards to these communal learning spaces we call schools, and design for others what we would create for our own child. Kohlmann’s question marks a great starting point. Dewey, J. (1917). Creative intelligence: Essays in the pragmatic attitude. New York: H. Holt. 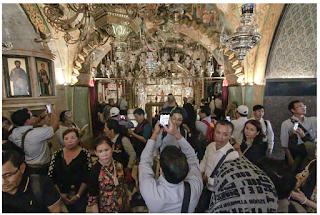 “History of the Jews in Calabria.” Wikipedia, Wikimedia Foundation, 19 Aug. 2018, en.wikipedia.org/wiki/History_of_the_Jews_in_Calabria. “Kibbutz.” Wikipedia, Wikimedia Foundation, 22 Oct. 2018, en.wikipedia.org/wiki/Kibbutz. Muller, Jerry Z. The Tyranny of Metrics . Princeton University, 2018. Stravinsky, I. (1942). Poetics of music: In the form of six lessons. Cambridge, MA: Harvard University Press. Woods, P. (2012). Critical events in teaching and learning. London: Routledge.